Not that it matters to David Beckham, but it was revealed today that he is the highest paid player in football. He took home an amazing £30.1million from salary and endorsements in 2008, £3.5m more than Messi from Barcelona. The picture comes from today's training session. 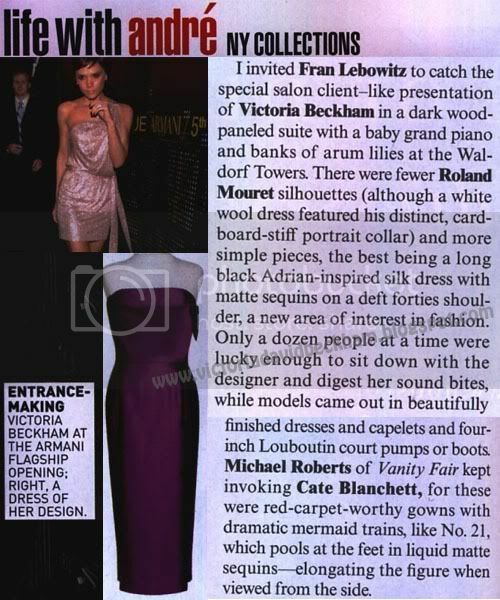 In the April 2009 edition of Vogue US, Victoria Beckham gets a brief mention in André Leon Talley New York Fashion Week column. Thanks to flyingal for the scan. BravoTV are having their 2nd annual A-List Awards. Just for fun vote for David and Victoria at BravoTV.com. Well, after two great results in the league we could only manage a draw away to Napoli. To be fair, they played really well and have a great coach in Roberto Donadoni, who was previously the Italian national side’s manager. I had a chance myself at the end of the match with a free-kick, but their ‘keeper made a great save, so a draw was probably a fair result. Unfortunately, that means that we’re now 14 points behind Inter. They’re playing really well at the moment and keep winning matches, which is something we need to do in order to keep up with the likes of them and Juventus. A Champions League place is definitely on the cards provided we’re consistent between now and the end of the season. Right now though I’m with the England squad. We won our first match against Slovakia. It was only a friendly, but I thought we played really well and that will give us confidence going into Wednesday’s qualifier against the Ukraine. For me personally it was an incredibly proud moment to win 109 caps for my country. To set up a goal for the team made it even more special and it’s a day I won’t forget in a hurry. Moving forward though, we know Wednesday will be a tough game and we’re under no illusions about what we need to do. The Ukraine have some top players, including my AC Milan team-mate Andriy Shevchenko, so we’ll need to be at our best, but I know the squad are determined to keep our 100% qualifying record and, with the fans behind us at Wembley, there’s no reason why we shouldn’t get the right result. "David made history on Saturday afternoon, when he stepped out onto the Wednesday turf to record his 109th England cap, a record for an outfield player. The ex-England captain celebrated his second half performance in style, setting up Wayne Rooney for England's second goal of the night with a trademark cross. David now stands second in the England all-time caps list, a fair way behind Peter Shilton, who marshalled England's goal an incredible 125 times. Victoria Beckham was a Wembley yesterday wearing her favourite Balenciaga blazer. The blazer creates a strong silhouette, and has sharp detailing, which Victoria dresses up with pants, or down with jeans. As you can see she loves the blazer, as she has worn it many times before. Here is a picture of Victoria Beckham leaving Wembley Stadium after the game. You can see that she is surprisingly wearing Abercrombie & Fitch flip flops. Surprising because it's very cold in London at the moment, and it's been raining most of the day. You can view more pictures here, wearing her Prps Boyfriend Fit Jean and Balenciaga blazer. Hopefully now Victoria is in town, we will get to see more pictures of her. Victoria Beckham, Sandra Beckham and boys were in Wembley Stadium to see David reach his 109th cap milestone. Wearing a black blazer and jeans, Victoria looked very chic. She was carrying 2 Man United red devils mascots. I wonder if they were for luck. 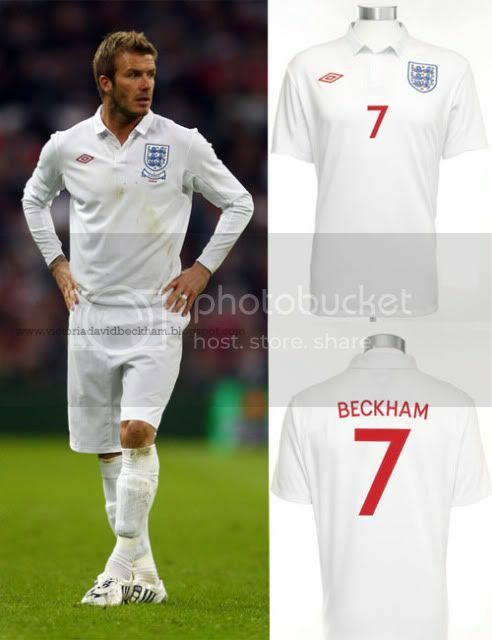 At kick-off, the England players unveiled a new all-white strip. The kit is reminiscent of the strips England wore in the 1950s with a collar and a prominent badge. Gone is the red trim which adorned England's other three strips in the last five years. The new shirt is plain and without frills. I personally love it. It's very classic. You can buy the new shirt from the Official England Online Store. 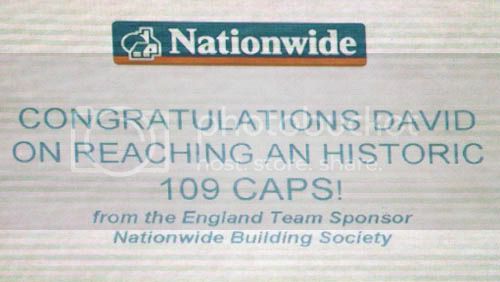 Nationwide Building Society - the sponsors - congratulated David Beckham on his 109th Cap via the giant TV Screen inside Wembley Stadium. David Beckham became England's most capped outfield player when he won his 109th cap as a halftime substitute in the friendly against Slovakia at Wembley today. 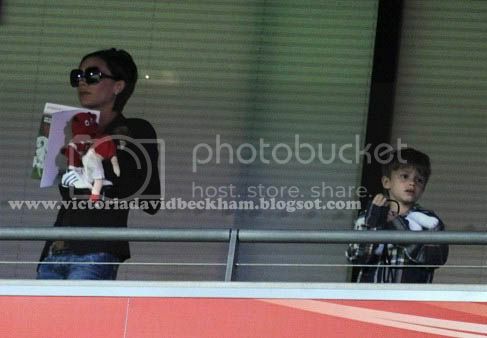 When he came on, the cameras panned to Victoria in the box, as she called to kids to watch Daddy come onto the pitch. So cute. David had a very good game wearing the #17 shirt. He fired a superb cross for Manchester United ace Rooney to score from just outside the six-yard box and make it 2-0 after Emile Heskey had given England the perfect start. The final score was 4-0. At the end of the game, David became very emotional on his historic night, which she shared with his family including his mother who watched her proud son. So emotional that he appeared to wipe a tear, as he clapped the England fans for the support at the end of the game. You can see his emotion in the last picture. Just when I think I can't love him anymore. It looks like InStyle loved Kelly Ripa in Victoria Beckham collection so much, they made her look the Look Of The Day. As I suspected Victoria Beckham and her boys arrived in London. The boys looked really cute in their Armani cardi's. As pointed out by Jen a few weeks ago, Victoria Beckham's dress is a hybrid of Minerve and Gavarnie Mirror. After a a no-show week, Victoria Beckham was finally spotted at LAX yesterday. She was accompanied by her boys as they - I guess - headed to London. David should play for England tonight at Wembley, and if he does, he will have his 109th cap, which will be a record for an outfield player. No doubt his family wanted to share the occasion with him, like they have so many times in the past. I know I always ask this, but I just wanted to double check - the kids are on Easter break right? 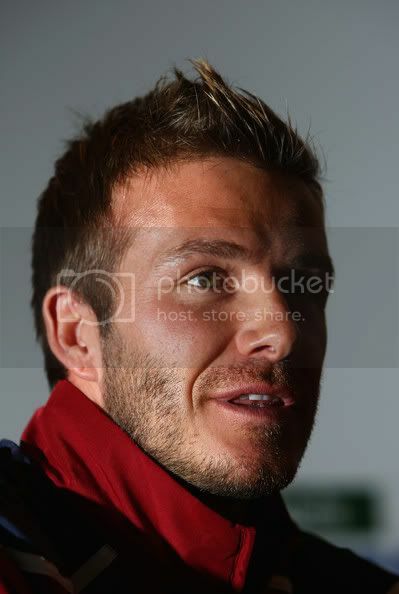 The cameras got up close and personal with David Beckham at an England team press conference yesterday in St. Albans. If David plays with the team this Saturday, it will be his 109th cap, which would be a new record, but he doesn't expect it to be for long. He said, "It is special. It’s great to be up there with the best and biggest icons. But I hope the player that breaks it is one of these players from within this squad." Who Wore Louis Vuitton's Spicy Heels Better?